Discover this fascinating island with your expert insightCuba Tour Leader and experienced Cuban Guide. Explore Old Havana and learn about daily life in the capital as you engage with residents from all walks of life. Dine at La Floridita, one of Ernest Hemingway’s favorite spots. Mingle with residents at a farmers market and visit a medical clinic for insight into the diversity of the Cuban economy – from its dual currency to socialized healthcare. Visit the Korimacao Community Project, a respected school of the arts. Learn about Trinidad’s stunning wealth of Colonial architectural on a guided tour of the Museum of Architecture. Our experienced North American Trip Leader and native Cuban Guide will take you behind the scenes in Havana - introducing you to artists, professionals and other residents eager to share insight into their lives. 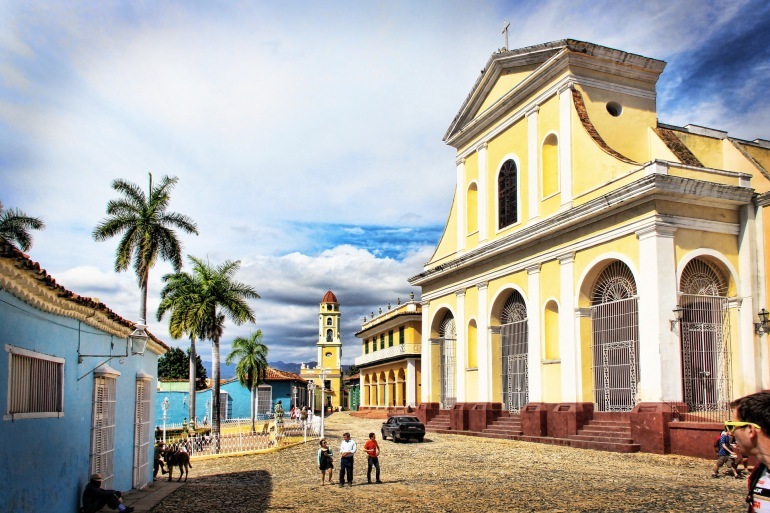 Then spend two nights in lovely Cienfuegos and discover the Colonial landmarks of Trinidad, two outstanding World Heritage Sites with a wealth of art and culture. Our whole trip was terrific. We learned a lot about Cuba and its culture. The Cuban guide was wonderful and informative. The guide was always there with answers, information and help of any kind. A wonderful trip. Overall, the Cuban trip was fantastic. It was an introduction to a society that has largely been closed to Americans, and I welcomed the chance to interact, however limited, with Cubans. Check in to the deluxe, conveniently-located Sofitel Hotel. Later this evening, gather with your fellow travelers for an important evening briefing and welcome cocktail reception. You'll enjoy VIP Priority check-in this morning for your nonstop charter flight to Havana! Upon arrival, you’ll be warmly greeted and escorted to the superior first class Melia Cohiba Hotel in the heart of Havana. After an afternoon orientation with your Tour Leader and Guide, you’ll enjoy a congenial welcome dinner at your hotel. Your first day of exploration here in the capital begins this morning with an expert in Cuban architecture who will discuss Old Havana’s rich architectural heritage and designation as a UNESCO World Heritage Site. Next up is a visit to Casa de Los Abuelos, a unique grandparents’ home that offers rewarding encounters with multiple generations of Havana residents. After lunch, learn about Afro-Cuban art, music, and dance at a unique organization in Central Havana and then spend time with university students and professionals for candid discussions about daily life. Visit with a Cuban artist in his studio and then top off your day with dinner at La Floridita, one of Ernest Hemingway’s favorite spots. Today, you’ll visit with a local historian at the fabled Colon Cemetery. Then you’re off to an intimate theater to meet with an internationally recognized dance company for special backstage access to the company’s dress rehearsal. After lunch, you’ll visit the Literacy Museum where you’ll hear about the inspiring time Cuba’s youth mobilized across the country to teach rural residents how to read. Later in the day, you’ll have the special privilege of meeting performers from La Colmenita, a children’s touring group that performs locally and internationally, including an acclaimed 2012 performance at the United Nations. This morning after breakfast, you’ll visit a local farmers market to experience firsthand Cuba’s dual currency at work. Then get another fascinating look into the island’s economic ways when you learn about socialized medicine and healthcare from patients, doctors, and nurses. We’ll also spend time at an organization in Old Havana that teaches trade skills - preparing residents for the new economy. After lunch, a knowledgeable expert is your guide for a tour of the Museum of Fine Arts. This evening, you’ll have the opportunity to dine on your own at a local paladar; these private, family-owned restaurants are becoming more popular all across the island as an alternative to state-run dining establishments. Your insightCuba Tour Leader is well-versed in the city’s dining scene and is available to make recommendations. After breakfast this morning, you’ll depart Havana and journey southeast through the picturesque countryside. Your first stop of the day will be in lovely Playa Larga to visit the unique Korimacao Community Project, a respected school of the arts known for developing musicians, dancers, poets, and actors. From Playa Larga, you’ll continue your journey to the charming town of Trinidad where you’ll check in to your comfortable hotel for a leisurely 2-night stay. Begin your exploration of Trinidad at the Museum of Architecture to learn about the city’s fine Spanish Colonial architecture, its historic preservation and well-deserved designation as a UNESCO World Heritage Site. Afterwards, you’ll have the pleasure of meeting a local artist at her studio. This world-renowned artist recently had her work displayed at the United Nations. Sit down to a delicious lunch followed by an exclusive visit with the singers, dancers, and musicians of the Ballet Folklórico de Trinidad. Later in the day, you’ll have an exclusive visit with our friends in their homes for an authentic taste of warm Cuban hospitality and a chance to get to know them surrounded by their families and community. You’ll also visit a casa particular, a bed-and-breakfast-like accommodation in a private family home to learn how the owners find their clients and sustain their private business in a state-run economy. Tonight you’ll dine on your own at another private paladar. This morning, you’ll depart for Cienfuegos, a lovely town known as “The Pearl of the South” where you’ll meet with artists at a local artists’ cooperative. Then spend time at the Coro del Cienfuegos to meet the young members and artistic director of this world-renowned children’s choir. Schedule permitting, you might even enjoy an impromptu performance. After lunch, you’ll make the journey back to Havana where you’ll check in once again at the superior first class Melia Cohiba Hotel. This evening’s congenial farewell dinner with your fellow travelers is a great opportunity to share your travel experiences and insights into Cuba. After breakfast, you’ll be escorted to the airport to board your nonstop charter flight back to Miami. The prices listed includes international flight from Miami to Havana. please note prices can vary depending on your choice of airport.